Moving home is one of the most stressful things you can do and when you add children into the mix, it can become a bit of a nightmare. However, moving should be a rewarding and exciting experience for the entire family, and with a few simple strategies, there’s no reason why it can’t be. 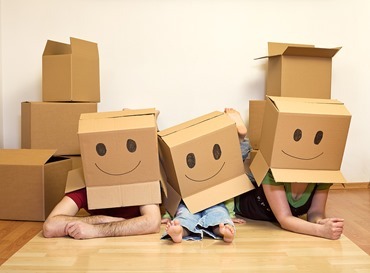 If you can, try to start packing and planning your move as soon as you’ve got the go ahead from an estate agent. This helps you to break down your move into manageable chunks as you can tackle a room at a time when you find a few spare minutes in the day. Divide your move up into rooms, focusing on one at a time by getting rid of any rubbish and sorting out all of your belongings in each. This can help to reduce the amount of clutter you’re taking with you to your new home and you’ll be amazed at just how much room you can save. If you haven’t used something in the last year, get rid of it or sell it! Whilst you may want to sell as much as possible to get together a few extra pennies, is having a garage sale the best thing to do at this hectic time? It can take a lot of effort to get everything together for this type of sale and it might not be the most effective way of selling things. If you’ve got big ticket items that you want to get some cash for, why not try photographing these and posting them on a local group on Facebook? That way, anyone who’s interested can pop over and collect the item without you having to waste a day trying to sell things to passers-by. Otherwise, bag up your unwanted clothes, toys and other bric-a-brac items and send them to your local charity shop. Before you move, it’s important that your children feel positive about their new home and the adventure that lies ahead. That’s why it’s a good idea to get them involved in the packing process, even though this may seem like more hassle than it’s worth! However, all you need to do is ask them to help with the packing in their room as this will help to build their excitement about the move ahead. Get a cardboard box and ask them to fill it with all of their favorite things that they want to take with them and then get them to decorate the box so they know which is theirs. This won’t just help them feel more positive about moving but will also help to keep them occupied whilst you sort out other areas of their bedroom, e.g. the wardrobe that you’ve been meaning to clear out of months! When it comes to the actual moving day, it may be a good idea to hire child care or get parents / friends to watch your kids for you. Watching over the removal men is going to be hard enough without trying to keep your eye on the kids too. Plus they’ll be much safer out of the way as heavy items are getting lifted and things are getting moved around. Prior to moving day, try to put together a checklist of everything that you’ll need to do on the day. Start by making a picnic the night before so you and your helpers are fully refreshed throughout the day. Keep the box with the tools for your beds handy so you can get these put up straight away once you get home and make sure you have some fresh sheets ready to make the beds with. This will help to make sure everyone has a comfortable first night’s sleep in their new home, which will be welcomed after a hectic day of moving! Try to priorities the kids’ rooms when it comes to unpacking so you can bring some normality to the house as quickly as possible. Get them involved with choosing the décor and furniture arrangement as this will again add to the positivity they feel about this new space that they’re going to be living in. Morgan Lambert spends her spare time tapping away at the keyboard as she works on another article. She writes about life; whether sharing parenting tips or discussing how to save more money.